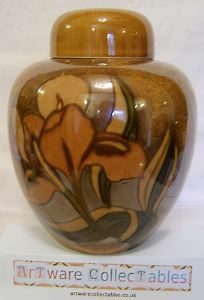 A beautiful and very stylish Iris Ginger Jar with Cover/Lid from Carlton Ware. This marvellous Jar has an impressed shape number 125/5. Set on a Brown Lustre Glaze is the Iris design giving a beautifully subdued effect. It stands 6.25 inches (16 cms) tall. It is backstamped appropriately with the Carlton Ware backstamp in black.